The Timberwolves have had a rough go of it this season. They sit in 12th place in the Western Conference at 20-34 and are a miserable 3-14 over their last 17 contests. Life won’t get any easier for the shorthanded Wolves tonight when they face the Lakers. The host of this evening’s 48 have bested the Wolves 20 straight times, the longest active streak in the NBA. These two sides last met on February 1st in Minnesota with the Lakers prevailing 111-100. Bryant led the way with 17 points, 12 boards and 8 dimes. Five other Lakers scored in double figures, and they battered the Wolves on the glass, 57-40. Excuses don’t cut it at the pro level, however veteran coach Rick Adelman’s team has been decimated by injuries to key players. 2X All-Star and member of the 2012 USA Gold Medal Olympic team Kevin Love has suited up for only 18 games this season. Athletic SF Chase Budinger has only competed in 6 contests, and 3X All-Star Brandon Roy a mere 5. Last year’s runner-up for ROY Ricky Rubio has been back for 29 after tearing his ACL last March. And to make a terrible situation worse, 11th-year starting SF Andrei Kirilenko will be sidelined after straining his left calf in Tuesday’s overtime loss to Phoenix. At 28-30 and currently in 9th place in the West, the Lakers have had to overcome injuries to Pau Gasol and Steve Nash. But their poor record can mostly be attributed to problems gelling, advanced age and internal strife. This Laker team with Kobe, Pau, Dwight, Nash, World Peace and Antawn Jamison was expected to make a run at the 2013 title. After all, their starting five has an All-Star at every position and a total of 33 All-Star game appearances between them. But after just 5 games coach Mike Brown was fired and Mike D’Antoni was hired. Los Angeles has been playing better ball of late going 11-5 in their last 16. However, the Lakers displayed two of their main weaknesses, turnovers and free throw shooting, in Tuesday’s 119-108 loss at Denver. They committed 15 turnovers and shot 14 for 31 from the charity stripe. Howard is shooting a career-worst 48.5% from the line was a painful 3 for 14. With only 24 games remaining in the regular season, every one is a must-win for LA if they hope to overtake Houston or Utah for a playoff spot. Tune in to TNT at 10:30 PM ET to see if the once Minneapolis Lakers (1947-1960) can continue clawing their way into playoff contention. Before joining Nike, I did a commercial for LA Gear with Karl Malone and Joe Montana. It was a long time ago, but I remember we shot it on a playground close to Venice Beach, and it was blistering hot. The shoot took all day, but Malone and Montana went the distance to get it done. They’re two of the most generous and genuine people you’ll ever meet. The 37-18 Memphis Grizzlies have won seven games in a row and currently sit 4th overall in the Western Conference. On January 30th GM Chris Wallace traded top scorer Rudy Gay to Toronto in a 3-way deal. Many Griz fans were upset and confused by the move. They wondered who would step up and help fill the void of Gay’s lost production. One player who has increased his scoring and rebounding in Gay’s absence is 9th-year SG Tony Allen. Hoopsheads know that Allen is a lockdown defender with elite athleticism. Every night he is assigned to guard the opposing squad’s best offensive 1, 2 or 3. Last year Allen was named to the 2012 NBA All-Defensive First Team for his proven ability to secure the perimeter with his long arms, quick feet and active hands. Allen has played in and started 52 of the Grizzlies’ 55 games thus far. In their 10 contests in February, the Oklahoma State product has averaged 11.2 ppg, 6 rpg, 1.4 apg and 1.7 spg in 29.7 mpg while shooting 58% from the field. Allen has season-highs of 19 points, 9 boards (2X), 6 dimes, 4 steals (2X) and 3 blocks. With two-thirds of the regular season in the books, many Fantasy GMs are looking to add or trade for a solid bench player who can step up and start when called upon. Tony Allen rolls with a talented, tested, veteran group, so he has limited opportunities to get the big stats. However, Allen is a hustle player who consistently contributes to the box score on both ends of the court. 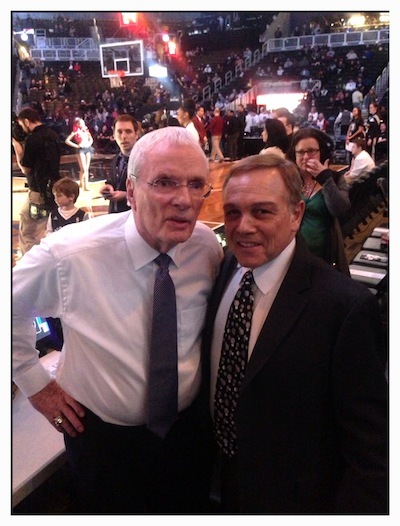 Was great to catch up with my good friend Hubie Brown in the booth before the Grizzlies vs. Nets game.